If you thought us humans were clever and successful, think again. We’ve got nothing on cyanobacteria, which have existed on Earth for an impressive 3 billion years (give or take a few hundred million either way), and also invented photosynthesis – thereby oxygenating the Earth’s atmosphere and making the evolution of oxygen-respiring higher forms of life possible. The planet whose unusual location and composition made all this possible is equally miraculous. Were the carbon cycle not in balance, for example, it would take less than a million years for all the carbon in the atmosphere and oceans to drain into the lithosphere (rocks), stopping the greenhouse effect and freezing the planet solid. Instead, the carbon cycle – and other elemental cycles like oxygen and nitrogen – have stayed relatively balanced over billions of years. Explaining quite why this should be is the central challenge of Earth System Science, which is the polite (and academically acceptable) name for Gaia Studies. 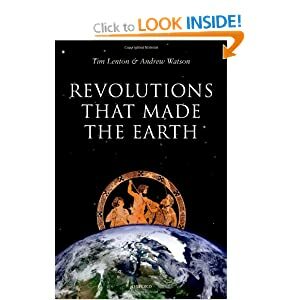 The authors of ‘Revolutions that made the Earth’, Tim Lenton and Andrew Watson, both professors at the University of East Anglia, are leading researchers in the former – and, as close disciples of the legendary Gaia theory originator James Lovelock, also of the latter. Their book, while not quite finding the tone to appeal to a mass popular audience, is certainly worth close study for anyone with more than a passing interest in the Earth sciences, from geology to climatology, and for anyone curious about why this planet is alive whilst all the other ones we know about are dead. Part of the explanation for the success of the Earth as a living planet simply has to be luck. Consider the ozone layer, for example. Ozone, as O3, forms in the upper atmosphere as oxygen molecules (O2) are split apart by ultraviolet radiation from the sun. Ozone, even in very low concentrations, then forms a sort of sunshade, blocking most of the harmful UV radiation from reaching the surface, where it would damage the DNA of living organisms. (We humans nearly destroyed it, of course, but that is another story.) We are also lucky that the Earth has a molten iron core, creating a magnetic field, which in turn deflects the Solar Wind – the stream of charged particles which continually blows out from the sun, and which would otherwise strip our planet of its atmosphere (as has happened on non-magnetic Mars). Sometimes the planet is unlucky, such as when it gets hit by very large asteroids (although the early bombardment from outer space 4.5 bn years ago brought along all our water and carbon), or when very large ‘flood basalt’ volcanic eruptions produce too much carbon dioxide all in one go and create a global warming/ocean acidification crisis (ring any bells?) and resultant mass extinction. The first oxgygenation of the early atmosphere also likely sparked a climate crisis which led to a Snowball Earth event – unlucky – but this was ultimately reversed by continuing volcanic CO2 releases – lucky – and so on. At the heart of the book is an exploration of why the Earth as a living system tends towards balance, as organisms set up nutrient recycling loops which act as stabilising feedbacks. For example, whilst the advent of photosynthesis initially poisoned what was then an anaerobically-alive biosphere with free oxygen, evolution then selected for new life-forms which could use this new oxygen to metabolise sugars, releasing CO2 and water in the process and starting the cycle anew. Similar stabilising feedbacks tend to keep the climate in an equable state too. Oh dear. Fascinatingly, we humans may come closest to falsifying the self-regulatory Gaia model than anything which has evolved in the biosphere over the last three billion years. Our capacity to utilise nutrients apart from just food (think iron ore, coal, uranium) far outstrips the capacity of the planet’s systems to establish balancing recycling loops. In some ways it is the renewable resources, like forests, fisheries and freshwater, which are being exhausted first, even though they are in theory limitless. Perhaps the worst damage we could do, suggest Lenton and Watson, would be to set in train conditions leading to an extreme runaway greenhouse scenario which eventually tipped the planet into a Venus-like super-heated state. Exactly how much carbon release is needed to trigger this is surprisingly not well studied by climate modellers, but it is thought to be unlikely. Even so, a more likely step might involve establishing a new stable climate but in a much hotter state not hospitable to complex life (though microbes might be fine). But here the authors part company from Lovelock’s late-stage pessimism – that we are already doomed. “As far as we can see no-one has yet made a convincing scientific case that we are close to a global tipping point for ‘runaway’ climate change”, they state. Interestingly, Lenton and Watson reject the ‘retreat’ scenario popular with greens, where we all have to consume and emit less in order to let Gaia work her self-regulating magic unimpeded. This is not realistic, they point out, and in any case is actually the opposite of what all other organisms do through natural selection, which is to maximise their consumption until they reach resource scarcity – and which strategy actually benefits the biosphere overall in the long-term because it forces recycling and the efficient use of nutrients. I won’t spoil the surprise, but the evidence cited by Lenton and Watson also argues strongly against localised ‘sustainable’ food production and reductions in energy use – instead far more energy, and not necessarily from exclusively renewable sources, will be needed if human civilisation is to become truly sustainable in any truly meaningful sense of the word. (Warning: this may involve the ‘N-word’.) The final chapter, entitled ‘Where Next?’ is a must-read for anyone who values science in guiding the environmental vision. But what about the very long term? Life will not continue on Earth forever. Our planet is already uncomfortably close to the inner edge of the solar system ‘habitable zone’, and within less than a billion years, as the sun heats up, the biosphere will overheat and cease to function. At the same time, as the Earth’s core cools down, plate tectonics will grind to a halt and so will the constant geological cycling of carbon and other elements – leaving the surface dry and lifeless. Which will doom us first no-one can say. This supports James Lovelock’s argument that Gaia is already quite old and we should be careful what further trials we force her to undertake. The Earth does not have an infinite time left to evolve new species after the Anthropocene mass extinction (which eventually may or may not include humans), giving a geological-scale reason why we should make more effort to conserve the world’s biodiversity. It also helps suggest an answer to an earlier question posed by the authors, about whether there is life on other planets too. Since habitable zones in any solar system will shift as the star warms up, so the time-span available for intelligent life to evolve is limited. On Earth we have come about only after a series of highly unlikely innovations – including photosynthesis and multi-cellular organisms – towards the end of our planet’s time of habitability. On the strength of this, and considering the lack of any results from the astronomical Search for Extra-Terrestrial Intelligence (SETI), we may well be alone in the universe. And that, for me, is another good reason to treat this Earth wisely. Lenton and Watson’s resort to the N-word should surprise nobody. Numerous “spaceship earth” belief systems emerged from research in “cabin ecology”, the attempt to develop self-sustaining micro environments, initially for submarines then later spaceships and projected space colonies. The space cabin was designed as a self-regulating cybernetic system with the capability of maintaining the chemical components of the atmosphere through negative and positive feedback loops that provided comfortable living conditions for the astronauts. James Lovelock worked extensively on space technologies for NASA’s Jet Propulsion Lab (his speciality was devices to detect life on Mars) before proposing, in1974, the Gaia hypothesis which postulated Earth as a giant space cabin, complete with a self-regulating system that maintained climate and chemical compositions comfortable for living organisms. No spaceship is complete without a reactor so the Gaians’ fixation with atomic power was perhaps inevitable. “…fundamental human rights.”, is a human construct only recognised by humans. It is meaningless in the context of a planet that can no longer support us and is actively but unconciously hostile towards most life, all brought about by human self interest. We cannot treat this as a philosophical musing, this is happening around us now and the future for our grand children appears to be catostrophic. Famine, thirst, flood and drought are unaware of human rights. Either we as a species need to rein in our excesses in a humane way now or nature will decimate humanity. Thanks for a fascinating review. The book looks like a worthwhile contribution to ongoing discussion of what, really, may be the boundaries/guidelines for human and non-human flourishing. And that question must take account of multiple uncertainties — cosmological, ecological, technological, political (the matter of what humans today and in future value and why). Thinking about the very long can lead to novel/odd perspectives. Even if humans have come late in evolution of life on Earth, we can still celebrate the wonders of the past and the nature of being opened to us by knowledge of deep time, and appreciate awesome destructive power of, e.g., the Permian extinction, and (!) comprehend that current Anthropocene destruction can also be put in context of what may be (if Martin Rees and others are right) only the beginning of life in the cosmos — a future whose beings may be to us as we are to bacteria. Considering the very long term should be done with caution, however: it’s like looking over a dizzying drop, and it can be a good idea to keep a firm grip on the handrail of the present. In this present moment we still have the challenges of massive inequity, and ever present dangers of tribalism and fanaticism in the name of religion or other delusions. Coming back to ecology, in the present moment, there *may* be more scope for optimism about (for example) extinction than some fear. That, at least, is Stewart Brand’s view: he thinks it will soon be possible to resurrect mammoths and have them restore grasslands (see here: http://www.theeuropean-magazine.com/268-brand-stewart/269-life-the-universe-and-everything). I have to say I am not yet convinced by Brand’s brand of optimism, although I have counted myself as a techno-optimist since the early 90s.